Being able to cover stories that draw attention to the selfless work some people do in order to improve the lives of others is one of the highlights of my job. 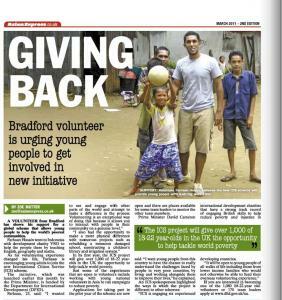 I recently spoke to Farhaan Hussain, a 23-year-old volunteer from Bradford who has been showing his support for a global scheme that enables young people to help out some of the poorest communities around the world. Furhan knows what rewarding work volunteering can be as he went to Indonesia with development charity VSO to help people there by eaching them English, geography and maths. Following on from the life-chaging experience, Farhaan was keen to encourage other young adults to become involved with the new International Citizen Service scheme. He told me: " I wanted to see and engage with other parts of the world and attempt to make a difference in the process. Volunteering is an exceptional way of doing this because it allows you to interact with people in their community at a genuine level." Even though my day to day job mainly focuses around news stories, interviewing people in the community and then taking photographs to run alongside the article, I also produce advertorials for various companies. 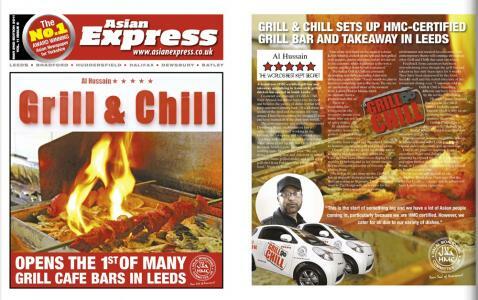 This particular project was a wrap for restaurant and takeaway Grill & Chill that would, as the name implies, wrap around the front cover of the newspaper. I was responsible for interviewing the owners of the establishment to get an idea of what the recently opened venue would be serving, its overall business model and any plans for the future. As the design team at the newspaper would be working their creative magic and putting the advert and text together to publicise the company, I needed to take photographs of all aspects of Grill & Chill such as the dishes that would be served, interior of the restaurant and staff that work there. As a result of the NHS's 'Safe & Sustainable' review of children's heart surgery provision across the UK, the number of heart surgery centres will be cut. The heart unit at Leeds General Infirmary (LGI) is one of the centres at risk so I went down to the hospital to meet a family that would be affected if the closure was to go ahead and carried out an interview and took photographs to support the piece. Working for a newspaper allows me to meet people from all walks of life. I recently had the opportunity to meet a barrister from Bradford who is the first Muslim from the north-east to be appointed to sit on Queen's Counsel. 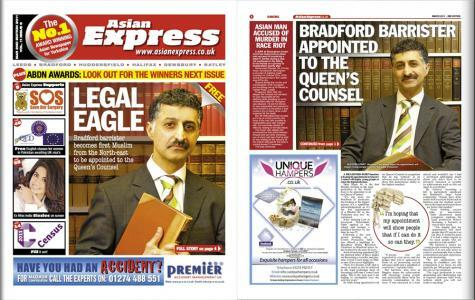 This was my first front-page news story for the Asian Express newspaper and I was pleased for the photograph I took to appear within the paper as well as on the cover. Tahir Khan is hopeful that his appointment will inspire other young people to enter the legal profession and advises anyone wanting to follow in his footsteps to strive to achieve academically, show commitment and gain experience through work shadowing. The 46-year-old barrister has worked at Broadway House Chambers in Bradford for the past 20 years and singles out becoming a recorder and part-time judge as one of the highlights of his career. In line with Tahir's impressive achievements, the father of three is setting his sights on the next landmark: "Now I've become a QC that is about as much as can be achieved in the legal profession short of becoming a full-time Crown Court judge. This is the next goal I am hoping to accomplish over the next few years."